A higher output vintage Strat pickup set with a combination of Alnico 3 & 5 magnets custom staggered to suit your neck radius. Still with great clarity & definition, the classic Strat pickup tones are boosted by the higher output and rounded with the custom staggered poles. A warmer bridge pickup due to the overwind & custom Alnico 3 magnets really takes you into crunchy blues territory, great for breaking up an amp. Match this with the slightly hotter-than-normal middle & neck pickups gives you a sweet set great for that '70s blues rock voice. 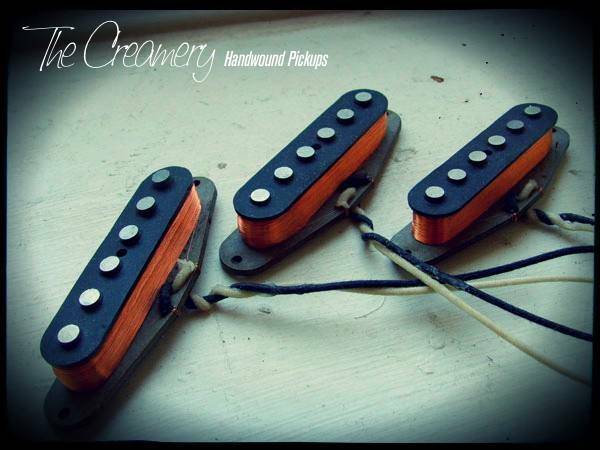 Scatterwound with wax potted coils and custom flat or staggered Alnico 3 & 5 magnets. Medium output. Vintage style cloth covered lead wire. A great bluesier, Stratocaster pickup Set.